Aging assets: pay now or pay later? Given the fast-paced nature of the facilities services industry, it can be difficult to keep up with all of the latest practices and innovations. To remedy this, we launched our Innovation & Insights newsletter. Each volume focuses on one of the six “Super Challenges’ outlined by the International Facility Management Association and the Royal Institution of Chartered Surveyors in their article Raising the Bar. The first issue looked at budging and cost management. The second delved into organization factors. The third tackled the trade skills gap, and the fourth was all about improving engagement and productivity in facilities services. The top tips for effective asset management. The fifth volume of our Innovation & Insights Newsletter lays out the most effective strategies for asset management. If you’re responsible for aging assets, there’s a chance that you’re also responsible for a fiscal conundrum. Should you spend money now to perform proactive maintenance? Or is it less expensive to run systems longer in order to reduce current labor and material expenses? These are important questions, and ones that facilities professionals across the world are grappling with. But there are answers available. Multiple studies have found that an effective preventive maintenance activity requires about one-tenth of the cost of a significant repair on the same piece of equipment. Additionally, effective preventive (PM) and predictive maintenance (PdM) programs are an operationally logical approach to minimizing the total cost for operations. And with an estimated $141 billion being spent on facility or plant maintenance each year in the U.S., the opportunity for savings is substantial. 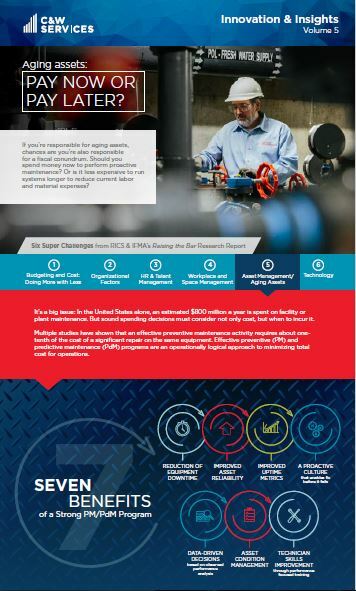 Download our newsletter and this article by David Auton, our Senior Director of Reliability Engineering, to learn more the benefits of preventative and predictive maintenance programs. If you like our newsletter, make sure to subscribe to receive future volumes.